Know of a stocked lake that is hard to get to? The best fishing kayak will get you to those spots that a regular boat can’t get you. Spending a day on the lake is going to be a great time and combining that with some fresh trout for dinner makes it even better. Kayaking provides killer upper body workout without even realizing you’re exercising. Their sleek narrow design helps them to be able to fit even in the most narrow of rivers. They are also lightweight and easy to transport giving you access to just about anywhere. Combining your love for kayaking with your love for fishing actively creates the ultimate super sport. We know you deserve the best kayak for fishing so we scoured the web to find just that. These boats are the top in their class. Enjoy reeling in your catch in this Sun Dolphin Aruba 10 kayak. With padded back support and an adjustable seat you are sure to feel incredibly comfortable here allowing you to stay out longer. With large covered storage areas you can comfortably bring all your gear with you for long distance paddles. Long hot sunny days are made easier by water bottle holders for easy access to your favorite beverage. Know of a lake that requires some hiking to get to? With this kayaks lightweight design and the handles on either end, portaging becomes even easier. With UV stabilized material you no longer have to worry about the integrity of your board after long days in the sun. Fading and weakness will no longer be of concern thereby increasing the lifespan of your best sit in fishing kayak. 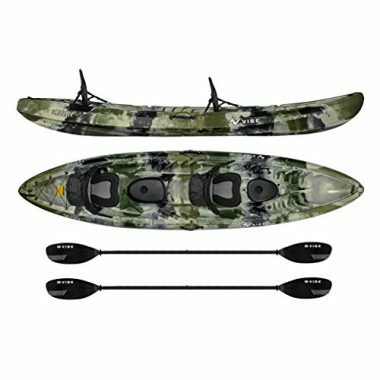 This is the best tandem fishing kayak that is constructed from heavy-duty PVC and will adapt to even the most rugged use. The Sevylor Coleman Colorado 2-Person fishing kayak tarpaulin bottom offers additional protection from punctures. If you do get a puncture, then there are multiple air chambers to ensure that you stay afloat. We love that there are holders and rod holders. We hate having to choose between the two, and now we will never have to. You can secure your rods, secure your paddles, and enjoy your lunch or a beverage. If you want to go even further and faster in your kayak, then there are fittings to mount a motor to. 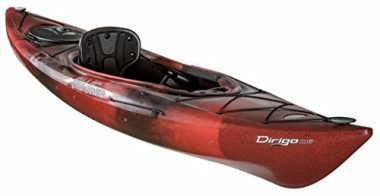 This is the best fishing kayak for a couple who want to fish together or a couple of buddies who want to get out into nature. This is the best inflatable fishing kayak that is incredibly durable as it is made out of PolyKrylar, a top of the line material. This allows the fishing kayak to have a 650 lbs weight capacity. 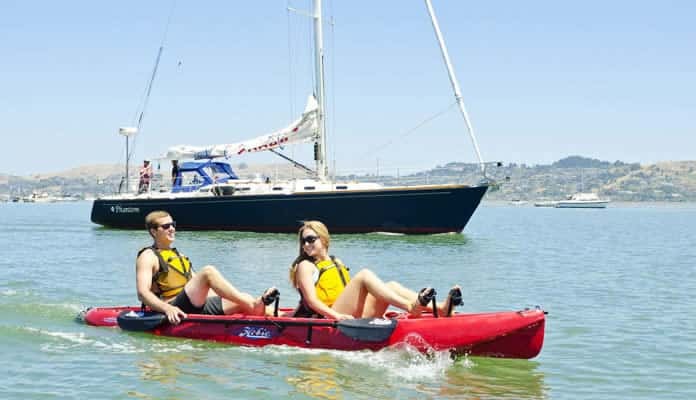 The Sea Eagle SE370 inflatable kayak can fit a maximum of three people comfortably. This inflatable kayak package features everything you could need to get on the water including two paddles, two seats a repair kit and spray kit. 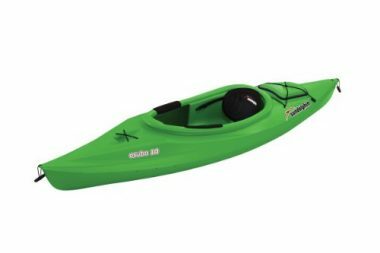 Not only is this a good fishing kayak, it can also be used in whitewater environments. The spray skirt will help keep you dry in rough conditions. The five one way valves will quickly drain all of the water accumulated in the bottom of the fishing kayak. It also comes with two skegs to keep you pointed straight. Being sun and salt water resistant means this kayak will have a longer lifespan. This is an excellent option for freshwater kayak fishing weighing a measly 32 pounds, much less than its competitors. This is the best sit on top fishing kayak perfect for the solo adventurer. The kayak looks good, and the bright colors are vivid and exciting. The kayak is extremely durable and comes with a molded seat. The seat is padded and has cushioned back-support. You can adjust the seat to fit almost any body type, making this kayak perfect for anyone. There is bungee storage on the front and the back, giving you a lot of storage options. We like the carry handle on the sides for easy transportation and the cup holders for added luxury. This is the best lightweight fishing kayak that has been designed to be versatile while extremely durable. The Advanced Elements AE1012-R kayak three layer shell ensures that it will stand the test of time and the odd rough landing on shore. A highly adjustable and comfortable seat will allow you to spend days on the water and not have worry about your legs falling asleep. The cockpit is wide, but comfortable while giving your legs room to move around and not feel claustrophobic. An advanced aluminum rib system creates added structure and stability to this high tech fishing kayak. There is no need for fancy transporting gear as this fishing kayak rolls up and fit into a compact bag allowing you to throw it into the trunk of your car. Even with this kayak being inflatable it has ample storage space featuring a below deck dry compartment and a bungee system on it’s deck. One of the best things about this fishing kayak is the waterproof storage. There are waterproof hatches which can store all manner of personal belongings. They are great for protecting your bait, wallet, keys, and snacks. There are also seven rod holders. This fishing kayak is built for two, but there are seven places where you can hold your rod. This gives you options for casting out, and it also gives you a choice between the number of rods you want to use at the same time. There are paddle rests, so you do not have to bring your paddle inside the kayak when a fish bites. There is also a generous cargo area for all of the stuff you do not mind getting wet. This is the best river fishing kayak for long fishing trips. You have enough room to pack as much as you like. There are spots for multiple rods. The crafted seats also give your beck enough support to not become fatigued through the day. 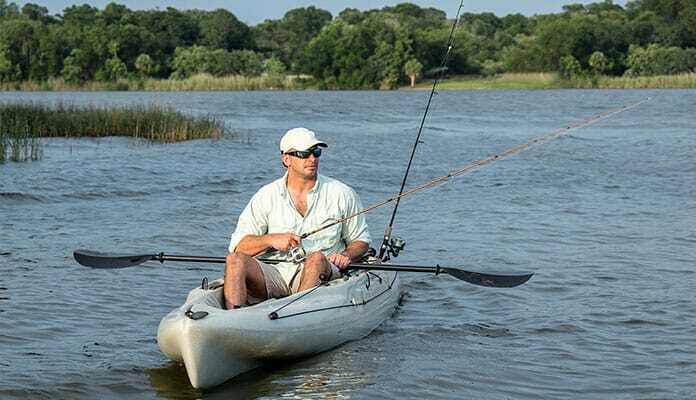 This is the best beginner fishing kayak for up to 3 people with enough room for all the equipment you need for your fishing trip. We love the included seats in this kayak. The seats are comfortable and give you support. They have great adjustability, and you will be able to find a position which will keep you comfortable all day long. There are also two rod holders to keep your rods while you are relaxing in those comfortable seats. The kayak gives you options too. There are 4 mounting points for you to add more rod holders if you wish. This is a great fishing kayak for families. Perfect for an adult and two children, or two adults and a child. This is the best stand up fishing kayak sports a completely open sit on top style deck. The Lifetime 10 foot Sport Fisher kayak allows you to spread out while keeping your gear within arms reach. The two seats and 500-pound weight capacity ensures that you can bring a friend with you to enjoy the weekend. A paddle clip secures your paddle to the boat allowing you to throw casts without worrying about losing your paddle. When you need to move around you can use the three included fishing rod holders to stow your rods. 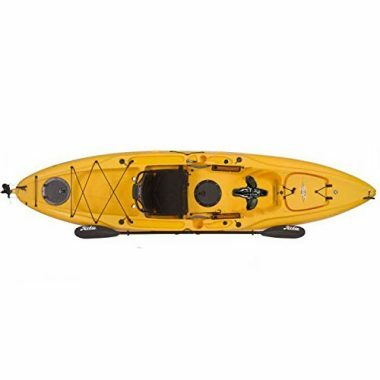 If you need more storage you can open the storage hatch and fill the interior of this stand up fishing kayak with your important belongings or strap items to the front with a bungee system. Lifetime is so confident in their product they include a 5-year warranty on the material used to make this river fishing kayak. This is one of the most comfortable fishing kayaks on the market. The molded seat is padded for all day kayaking. You can fish from dawn until dusk, and you will still feel comfortable. The seat is also adjustable so you can find the perfect fit. There are also built-in thigh and knee pads as well as a foot brace system. Everything comes together to give you the most comfortable ride of your life. We like the storage area in the stern. This saves you from having to store your bait and other fishing equipment around your feet. This is perfect fishing kayak for the fisher who enjoys long days on the lake catching fish. The Hobie Mirage Outback kayak is an all around high quality rig. The high carrying capacity allows you to carry all of your gear with you no matter where you go. Ride in style and comfort with the specially designed, fully adjustable seat. 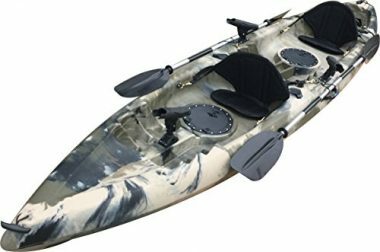 Perfect for long days on the water this fishing kayak with pedals includes rod holders and paddle clips making fishing that much easier. Don’t worry about getting your important items like a cell phone or book wet with the two watertight below deck storage compartment. Taking technology to the next level, the Hobie Mirage offers a foot pedal propulsion system. Simply move your feet to maneuver the boat wherever you’d like to go. Want to turn quickly? Just pull one of the shift cables and you’ll be headed in the other direction in no time. This is one of the best ocean fishing kayaks available. When looking to take to the water for the intent to fish, there are a few key features to look for. Your fishing kayak should have a few extra special features than your standard kayak. This is most often seen in the way of rod holders and paddle clips, but it helps to pay attention to a few more things as well. Fishing kayaks should be easy to get in and out of the water even though this type of kayak can be heavier than a standard option. A sit on top fishing kayak will be on the easier side to get off your car and in the water. This option will typically have more handles which allow you to get a better grip when carrying it. But one drawback is when this boat flips. Since it has a completely open top it will take some skill to flip it and get it free of water. With that being said, we like this type of fishing kayak as it’s easy to climb back aboard when it actually gets upright. This is one of the keys to finding the right boat. If you have nowhere to store the gear you need the kayak is not for you. Storage options come in two types: a bungee system and a dry hatch. Most boats will have at least one of each, except sit on top options. This type of kayak will already have more storage though as you will have more flat deck space. A bungee system will give you the option of strapping a waterproof backpack to your deck. This will let you carry everything you need for your entire trip in one bag. You can even store a tent to set up a basecamp on the other side of the lake. If you have electronic devices you need to keep dry a hatch system should be on your radar. This type of storage will keep your gear dry and secure even if your boat flips over. A bungee system is great but is susceptible to letting gear fall off. But all this is mute if you can’t quickly and easily access your belongings. Most manufacturers understand this and put at least the dry hatch within arms reach. This is an ideal place to store a cell phone or camera and even your GPS or fish finder system. The best part about kayaks is that they are, for the most part, reasonably priced. No matter what your budget is you will be able to find a kayak for you. When you get more experience and require more features is when the price starts to increase. More expensive kayaks will have more advanced features that basic ones. This can be seen in the weight, materials and specialized aspects of the kayak. But just because a manufacturer focuses on a feature doesn’t necessarily mean it’s worth more money. If you find a kayak that doesn’t have features you are looking for you can add them after you purchase it. There are companies that specialize in kayak additions that will make your life on the water easier. For example, if you love fishing and your kayak doesn’t have any fishing rod holders you can add them to your rig. There are some extra things you should consider when looking for the best fishing kayak. Some critical features are not added or talked about by the companies who make them. One of these features is being able to stand up in your kayak. This should not be overlooked especially if you are fishing. Being able to stretch your legs and change your position will allow you to spend more time in your kayak out in the middle of the water. Some boats even have pads that you can kneel on to switch up your position. Lots of fishermen especially like this as it can make it easier to get a better point of view on the water below you. This helps you not only to view the fish and your surroundings better but also can help you to better cast a line. Having a kayak that is stable enough to switch up your positions will greatly work in your favor. This is an especially important feature for those who are likely to experience aches and pains after prolonged sitting due to a bad back or knees. Being able to adjust your seat to accommodate different positions will also make your time more enjoyable. After all your kayak is supposed to be yours. This means being able to conform to your body. Your kayak’s seat should be adjustable to accommodate you sitting upright and also lounging backward. This is essential in ensuring that you’re comfortable enough to sit for long days out on the water. If you do not love your seat there is still lots you can do. Investing in a better, more comfortable kayak seat will do wonders to ensure that your kayak sits comfortably. This is great to allow you to be able to sit for longer periods of time out on the water. This is an especially important consideration for those with bad backs. You will also need a place to hold your fish finder and transducer. While enjoying the peacefulness of a day out on the lake is a great reward, one of the key parts of fishing is to actually catch fish. In order to get the most success on your day out of the water, you will want to have a kayak fish finder in tow. Fishing should not involve you having to hold your fish finder while you struggle to paddle. Most kayak fish finders will come with a way to hook your unit up to your kayak. This will allow you to have a hands free experience so you can focus on your paddle. While this may not seem like a big consideration, in the long run having this feature will do so much to improve your fishing experience. Be sure to pay attention to where you place your fish finder. You will want to try to find somewhere that is both easy to read while you paddle your kayak but also that doesn’t get in the way of your natural strokes. This can be tricky and may require you to put additional thought into the fish finder you choose to buy. You will want one with big enough writing that you can easily read it from a distance. Rod holders should also be on your wish list as well. Most top rated fishing kayaks come standard with rod holders but if for some reason, yours does not you will want to quickly equip your boat with this. Rod holders can make all the difference on your fishing trip. You will not be able to juggle your rods and your paddle, nor will you want to. Being able to cast your line and then rest your rod in the holders will make all the difference to your fishing experience. This goes a long way in ensuring that you don’t spend your time juggling your gear when out for a relaxing day on the water. Paddle clips also typically come standard on fishing boats but are important to ensure that you have. This is a simple clip that attaches to your boat and hooks your paddle. This allows you a safe place to stow your kayak paddles while fishing or simply enjoying a snack. While you may think you can just put your paddle across your lap, this could lead to it falling off and you being in a bad situation. Having the peace of mind that your paddle is safely stowed away is incredibly important. This will provide you with peace of mind to sit back and relax. This should not be an optional purchase for your boat. Being able to add on to your rig will allow it to grow with you. Don’t expect a beginner kayak to do everything you want it to as you gain more experience on the water. It is important to consider a boat that will grow with you. Having a boat that is easy to accessorize is the best way to ensure that your purchase will go the furthest. As you gain confidence on the water, you will likely want to expand your paddles to explore deeper and more intense waters. Heading out to farther distances and potentially even on overnight trips, you will need to begin to think about added storage. Eventually, you will want to add a fish finder so that you can track the fish in your area. It is important to find a boat that this can be easily installed in. You will need to run a transducer line that sends the sonar below your deck which then indicates where the fish are on the screen. A designated place for the handheld device will also be something to look for as this should be within arms reach. Finding a boat that gives you these options will save you money in the long run. Not having to buy an entirely new fishing kayak every year is the goal and accessorizing it is the way to do this. It will also allow you to start with a more basic setup that you can completely make your own through the added pieces. There’s a reason sea kayaks are excellent for fishing. They have an excellent combination of features that allow them to surpass their competition. Obviously, kayaks don’t use motors to propel you through the water. This makes them incredibly quiet and able to sneak up on the fish. Bigger vessels require much more horsepower to move them through the water while ocean kayaks have been specially designed to move quickly through the water by simply paddling. Being able to paddle into a lake at dusk when the fish are feeding without disturbing them is what you’re gaining with this type of boat. All you need to do is put your line in the water and you are nearly guaranteed a catch. But this speed also allows you to get off the water quickly when you want to. You will be able to move silently with the only sound being that of the paddle making contact with the water. Not having to keep your boat out of the weeds is no longer a though with a sea kayak. Most of the time this is where the fish are hiding, so you are missing out on prime hunting grounds. Ocean kayaks have been designed to be thin and maneuverable which allow you to weave through rocks or dead heads sticking out of the water. Even though these kayaks have been designed for the ocean they are great in lakes as well. No matter what the conditions are you can get as close to the shore as you want. If there are deadheads in the water you can work yourself through them with ease – even fish amongst them. If you’ve never experienced fishing in these spots you are seriously missing out! Sea kayaks are not that much more money than regular kayaks. And when you compare this cost to a full fishing boat, you will have yourself a deal. 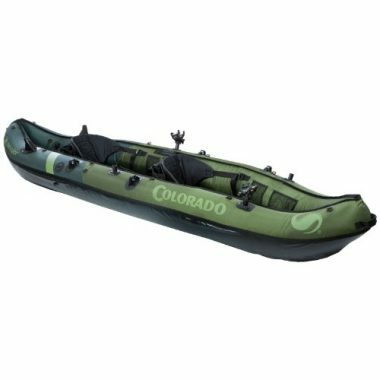 Instead of spending tens of thousands of dollars on one of these boats you will be looking at more around $500-$1000 for a fully set up fishing kayak. There are other things to consider as well. The cost of maintenance of a sea kayak is also significantly less than that of a boat. Winterizing and summarizing boats can cost hundreds or thousands of dollars a year. Their engines need to be tuned by a professional before the first trip of the year to ensure they’re running properly. There is no fuel cost associated with sea kayaks as well. This alone can total upwards of a couple hundred dollars a trip. Large fishing boats also require a large trailer and full size truck to pull it. This adds even more to the cost of owning a dedicated fishing boat. You can get a trailer for your ocean kayak, but they are small and lightweight – you are even able to pull them with a small car. or large trailers to pull them. Most of them even fit on small cars. 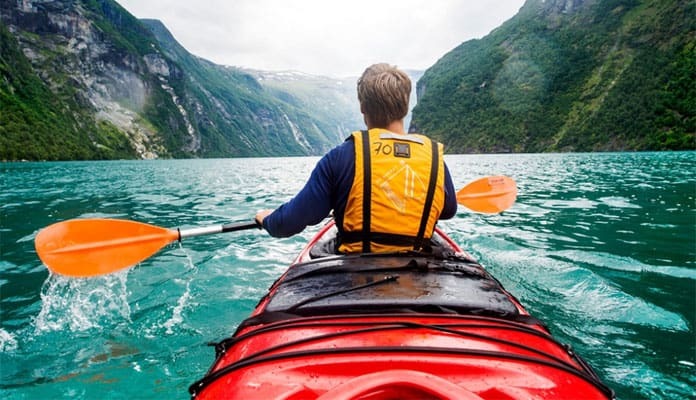 Insurance alone can cost more in a year than a well equipped sea kayak. Not with sea kayaks. You will want to ensure you get insurance for your boat, but it will cost nowhere near that of a fully rigged fishing boat. You don’t need an electric motor to troll in a sea kayak. All you need is a rod holder and to paddle the same speed as fish swim. This has been said to be around 2 knots an hour or a little less than an average paddling stroke. Speed is important as it will allow the fish to realize there is food and swim to catch it. If you paddle faster than they can swim you will never catch any fish in this way. The benefit of having the best kayak for fishing is that there is no motor moving you forward. Even electric motors create vibrations in the water that fish can detect. Paddling a kayak is much different. Even though you have to put the paddles in the water to move forward it doesn’t create nearly the same disturbance as a motor does. You will also have the most amount of control over your speed. No longer do you have to turn a handle in order to determine the speed of your boat. You can simply paddle faster or slower depending on your area and the fish congregating around you. A fish finder will also help to tell you which part of the lake has the most fish. We like to setup our rod and put a line in while we troll the lake to see where the fish are. Once you have this information you can then take hold of your rod and start throwing casts. Having a kayak is only good if you can use it often. Ensuring that you get a boat that is convenient for you is incredibly important. While having a vehicle and roof rack is the best way to get the most out of your kayak there are many other ways to do this. For those that do not have a roof rack, you can always look into purchasing a small kayak trailer to pull behind your rig. For those that do not have a car or are otherwise looking for an alternative solution, having an inflatable kayak is a great option. This type of boat is especially popular for those that have small homes such as apartments. These boats shrink down to an incredibly small making them a dream to store. Typically folding up small enough to fit into a backpack, these boats are an incredibly convenient way to get your boat from your home to the water. These become so small and lightweight that you don’t even need a car to transport them. This is a large part of their appeal. Getting to the water has never been easier when you have roof racks installed on your vehicle. All you have to do is fill your waterproof backpack and throw it in the back of your car, strap your kayak to your roof and you’re off to the water. This can take less than 30 minutes to do which makes it great for an evening activity after work. You can get to the water before sundown in order to catch the fish jumping on the lake. This also works out great for those looking to go camping over the weekend. The fast setup allows you to be ready for the next day’s fishing. This experience becomes even more convenient for those that have kayak trailers. These are great as they allow you to deliver your boat straight into the water without having to carry it. Many avid paddlers prefer this method of transport. Using a kayak trailer will allow you to pack your kayak beforehand and store your kayaks in the trailer. From there, all you have to do is hook your vehicle up to your trailer and then be on your way. This is an incredibly ideal option for all paddlers that have a tow package on their car. When you get to the water there is no lineup of boats waiting to launch. All you have to do to get it into the water is take if off of your roof or kayak trailer and you’re ready to go. This makes it a much quicker process than you would face with smaller boats. As kayaks are non-motorized, there are often not any restrictions on the body of water you are allowed to dock on. This opens up your realms of possibility as you can explore even more areas. It is important to consider the convenience of storing your kayak as well as transporting it. Having a kayak roof rack will help to suspend your kayak in the air and make it so that you can keep your garage more organized. Storing your kayak indoors can do wonders on preserving the integrity of the boat rather than exposing it to the harsh elements. Kayaks are not light, especially ones fully loaded with gear. Having a kayak trolley is a great way to ensure that you can transport your fishing kayak from your vehicle to the water without hurting your back. This is especially important for fishing as you will be bringing a lot of delicate gear down along with you to the water. A more stable boat will allow you to throw better casts. This means you will want a boat that has a wider width than a typical kayak. You should look for one that is more than 34 inches which will ensure you don’t tip when moving through your movements. Opting for a boat that has quite a low center of gravity is also a great idea. The lower you sit, the more secure you will feel. Additionally, when you opt for a heavier boat, you will find that you can sit much more secure than you otherwise would. The type of hull can also affect how well you can throw your cast. A v-shaped hull will give you added secondary stability. Primary stability is when you’re simply sitting in your kayak. But when you’re in rougher water you’ll need more secondary stability. This is when you’re kayak is tipping in the water. Secondary stability is what stops your vessel from tipping completely over in the water. This secondary stability is the main contributor that makes throwing casts easy. You will have so much stability that you can even carefully stand up for a more powerful throw. It will also allow you get a better vantage point of the water. This is one of the key features that make paddle boards so great for fishing. But with this option in ocean kayaks, the playing field is more level. The two main types of kayaks for fishing are sit on top or sit inside. There are also pedal, sailing and inflatable kayaks that are excellent for fishing. Each type of boat has its pros and cons in regards to fishing. Just like the name suggests a sit on top kayak has an open concept where your legs are exposed. Some have a completely flat deck while others have high sidewalls that leave your legs and feet exposed. This type is good for fishing as you can move around on the deck, even standing up to throw long casts. These are usually made out of polyethylene or fiberglass making them affordable. Not being the most lightweight boats the sit on top type makes up for their weight with their durability. They have tons of storage with bungee systems and rod holders making them the most popular type of fishing kayaks. 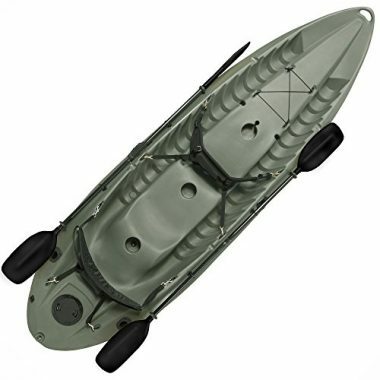 Another popular type of fishing kayak is the sit inside version. It features high walls that come up out of the water and around your legs. There is a hole for you to slide into keeping your legs dry and out of the way. They usually have multiple storage hatches under the cover of the walls with a bungee system for all of your gear. This type can be made out of any type of material ranging from polyethylene to kevlar. Since they use more material the price is higher than the sit on top counterpart. A low center of gravity gives this boat a low profiled design that is great for stability. Their shape helps to create a fast boat that can move through the water with ease. But since they require you to be confined it is recommended to take classes to help you with emergency maneuvers like the Eskimo roll and proper paddling technique. These special kayaks allow you to move around and steer without using your hands, making them perfect for those looking to fish. The technology has created a great system that is on the heavy side. You may need a truck or large SUV to transport this boat because of its weight and size. Depending on the manufacturer the materials can range from polyethylene to kevlar or even fiberglass. These will have lots of space to store your gear and even move around on deck. They are stable and are a good option for people with shoulder or upper body injuries. The world of inflatable boats has come a long way in recent years. Now military grade PVC is widely becoming the standard material used to create these boats. It is exceptionally strong and even puncture resistant. These are extremely portable usually rolling up into a small compact package. There is a trade off for their portability. They are usually slower than their rigid counterpart and need to be used with care when fishing. There are many features you should keep your eye out for when searching for your kayak for fishing. It is important to pick a boat that is made with high quality materials which will stand the test of time. Features like rod holders and racks will allow you to fish in complete comfort while enjoying the view and a beverage. The materials used to make your kayak will determine everything from durability to weight. It will affect your experience on the lake to the purchase price of your rig. Some materials are easier to damage and repair while others cannot be fixed once damaged. Polyethylene is one of the main materials used in kayak construction. It is a hard plastic that is resistant to scratching and denting. Kayaks that use a single layer will be a little heavy but durable. Ones that utilize a three-layer system will be more buoyant. The side that touches the water are shiny, which reduces the friction and drag of the water while the inner side is slip resistant. This type is more prone to damage as it has more layers but is still a good choice of material. Fiberglass is one of the more expensive options of construction. But with the price comes added features. Being one of the lightest and most repairable material, fiberglass is great for long distance traveling. It is prone to damage from the shore but if you are careful will last for decades. Kevlar is the highest end material a kayak can be made of. It is the lightest material that is also the most durable, but the cost will take your breath. It is relatively easy to repair not that that will need to happen at all. Never be on the water without a place to put your rod. These handy holders will allow you sit back with your feet up and enjoy the day without having to hold your rod for a prolonged time. Fishing kayaks usually have more than one rod holder so that you can cover more ground and not have to struggle with your lines. They will either be specially placed flush mounts or a deck mount system. A flush mount is essentially a designed slot in the top of the boat. It allows you to insert the end of your rod into it for quick access. The deck mount option consists of a rod holder that is screwed into the top of your boat which can swivel and tilt allowing for the most control. If you do have more than one rod that you will be using, look for a rod rack. This is a place running along the length of the kayak that holds your rods while you set up in the perfect spot. One rod can be for long casts while the other for trolling. No matter your set up a rod rack and holder will add to your experience. Depending on which style you decide to buy your storage and transportation will look vastly different. While inflatable rigs are ultra portable and will fit into backpacks the rigid boats will need a little more time and effort to get to the launch site. We suggest measuring your vehicle and comparing it to the size of the kayak you are looking at. People with trucks and large SUV’s won’t have to worry about transporting, but people with cars may have an issue. But there are always ways to make it work. There are kayak racks for the roof of your vehicle that will allow you to throw your rig on your roof to get it to the lake. Another option is a lightweight kayak trailer which can be towed behind your car. If you have the room to store it, a trailer will allow you to carry multiple boats without the need to attach a rack to your car. If you live close to the body of water you can invest in a bike trailer. This will give you exercise and allow you to transport your kayak with ease. Even though these kayaks are made to be in the water, they are not designed to sit in the elements. The sun can warp and break down the material used to make these boats. We suggest finding a space in your garage for your toy. Try a hanging system that will get it out of the way of your car and utilize the unused space. If you don’t have a garage try building or buying a shelter system. This will significantly increase the lifespan of your kayak. These inflatable bags ensure added stability for your kayak, perfect for yourlong trip up the river. Easily strapping to the sides of your boat they inflate when you need the stability. You can start your day with them deflated and use them if the water gets choppy or you need the stability when throwing your casts. They cause a little drag when paddling with them deflated but are much easier to attach before you start your journey. The features of your kayak will differ vastly depending on which type of water you will be using it in. 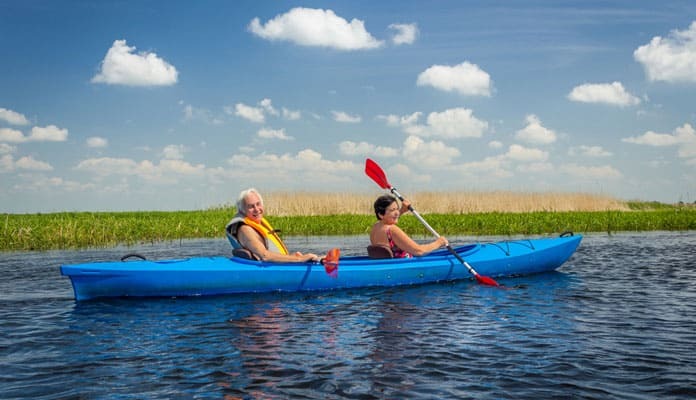 For smaller bodies of water look for a shorter kayak. This will make it easy to turn and move around. Larger bodies where you are paddling long distances a longer sleeker boat is a better choice. This will increase your speed by reducing the resistance when paddling. If you are angling in still water on a small body your kayak will need to have stability especially if you don’t have to paddle far to get to your spot. If this is your regular use of your kayak you should look at a ride on top style. It offers excellent stability while being easy to turn and maneuver in the water. Larger lakes may need a different approach, especially if you need to paddle a long distance to your spot. Longer, skinnier boats will get you to your ideal location quickly, but give up a little stability when stationary. This can be combatted with a sponson system which will give you the stability you give up with a longer boat. If you frequent a moving body of water like a river look for a boat that has a pedal powered kayak system. This will allow you to fight the current while having both hands on your rod giving you the dexterity to throw casts while the peace of mind of not drifting into hazards. Fishing in a kayak on the ocean can be challenging and dangerous. The farther you go offshore the more intimidating the experience can be. Hazards include high winds, large swells and fast changing weather. In shore is said to be in water that is less than 70 feet deep. If you’re planning on fishing in this type of water it is recommended to have a long skinny boat that will be able to move quickly through the water. If you are worried about overturning your rig you can opt for a ride on top kayak which has more stability and is virtually unsinkable. Offshore kayaking can be intimidating. Waters are deep and the horizon blank. Generally, fisherman like to use a long narrow boat that can get them home quickly if something goes wrong. It is strongly recommended to have training on emergency maneuvers like the Eskimo roll for if you overturn. Your day can quickly turn bad, but with these skills you can help yourself combat the harshness of the offshore environment. The gear you bring with you can make your day or weekend trip more enjoyable. This is one of the main ways you will get around the water. Your paddle will be one of the most used items so you are going to want a high quality one that is comfortable and easy to use. They come in a double bladed style but can also be a single sided canoe style oar depending on your rig and use. If you frequently paddle in choppy conditions a spray skirt is a viable option for you. It is a piece of material that wraps around your waist and connects to the brim of the kayak. This system is designed to keep you warm and dry for extended trips. This is a nice kayak fishing accessory to always have in your pack as the weather can quickly change while on the water. The US coast guard considers kayaks a watercraft which require you to have a life vest on board. It may seem like an inconvenience, but a personal floatation device can save your life. There are low profile options that will not interfere with your paddling or throwing the perfect cast. For those dedicated to saltwater kayak fishing, being able to keep your gear dry no matter the weather or water conditions will put a smile on your face. When looking into the top fishing kayaks, keep your eye out for dry storage. This is usually a hatch that opens on the nose or tail of the kayak which ensures that your gear stays dry even if you roll your kayak. Everybody who has fished knows what a padded seat can do. Not only will it make you more comfortable, a seat will allow you stay on the water as long as you want. Kayak seats are adjustable and can be made to fit nearly any person. It is important that it provides a lift which will make it less likely your legs fall asleep. This is an anchor system that allows you to maintain your position in the water. It includes rope that runs the length of the kayak which the anchor is attached. This can be adjusted depending on where you want to stay. This is a handy feature that will allow you to fish without worrying about drifting away. If you are traveling on the ocean to fish a GPS system may be a good addition to your gear. You don’t want to get lost or not be able to find your way home especially since the weather changes quickly offshore. This is the way you move around in your kayak. Long ago are the days of just using a paddle to move you around the water. The most common way of moving around in a kayak is by your own strength. A double bladed kayak paddle is more than likely the way you will be getting around the lake. It offers excellent control and ease of maneuverability while giving you a full body workout. You will be surprised how much your strength will increase after a few days on the water. You wouldn’t initially think of a sail powered fishing kayak, but it is an option. Some kayaks have a sail attachment where you can use this trusted option to power your rig. It may not be the most practical to use while you are out on the ocean but can get you to your ideal spot in no time. Q: Is It Okay To Buy A Cheap Kayak? A: Yes! There are many reasons that you may want to opt for a cheaper budget. Most often this has to do with budget restrictions. If you don’t plan to use your kayak very often, then it may not make sense for you to invest in an expensive high end boat. This is fine as there are many kayaks that you can get that are of decent quality and come at an affordable price. It is important to remember that with kayaks, you often you get what you pay for. While you may find a cheaper kayak to have all you need, oftentimes these boats may not feature the same high end materials than more costly boats. Oftentimes this means a heavy, less durable boat. These kayaks are also often more bulky in the water making them more difficult to maneuver. When looking to get a boat, be sure to consider the costs of adding upgrades. While you may think getting a cheaper boat will save you money, if you have to add on accessories such as rod holders and paddle clips then, in the end, it may end up costing you the same or even more. Regardless of the kayak you choose, you should check important features such as storage, maneuverability, stability and weight capacity. If you are looking for a specialty boat you will want to ensure it not only has extra storage but also the features you need. This can be in the way of rod holders, tackle box, and even molded in cup holders. Q: What Is The Best Kayak For Beginner? A: This question is not easily answered. The truth is, it depends a lot on personal preference and comfort. Moreover, you should consider how much you plan to use your kayak and how quickly you think you will develop your skills. If you plan to use your kayak often, then you will likely require a boat that has some added features. This will help you to build your skills and make it so that you don’t have to get a new kayak shortly after your purchase. Opting for the Hobie Mirage Outback Kayak may be a better option as it will still accommodate you as your kayaking skills develop and you begin to take on different boating activities. If you plan to use your kayak only on occasion then you might be able to get away with a more affordable beginner kayak such as the Sea Eagle SE370K_P Inflatable Kayak with Pro Package. This boat is incredibly stable which makes it ideal for beginners as you will be able to cast your line with more confidence. Beginner boats will also often be lighter and therefore easier to maneuver in the water. Q: How Much Storage Should My Fishing Kayak Have? A: Again, this depends although it is a lot easier to determine. You should first consider what you intend to use your boat for. Are you just going to be taking it out for a couple hours of fishing or are you instead planning longer outings or potentially even multi-day trips? Using your kayak for fishing will require more storage than normal. This is simply because you will be carrying more gear than a typical paddler. Not only that, but you will need space to put your catch. Generally speaking, we recommend looking for a kayak with both front and rear internal storage as well as additional bungee systems on top to allow you to store even more goods. You will want to bring along dry bags and extra rope and bungee cords along with you. This will allow you to better secure your gear and allow you to even secure a cooler to bring along. As a general rule, the more storage your kayak has the better. This is not an area that you will want to give in as being able to bring the right gear along with you will make you a happier, safer paddler. This becomes even more crucial the moment you start to use your boat for longer trips. Q: Are Fishing Kayaks Safe? A: Using a kayak for fishing is an incredibly safe way to enjoy the peacefulness of the lake. This boat, while small, is incredibly stable as you sit with a low center of gravity in the water. This makes it so that you will have an easy time casting your line and reeling in your catch. 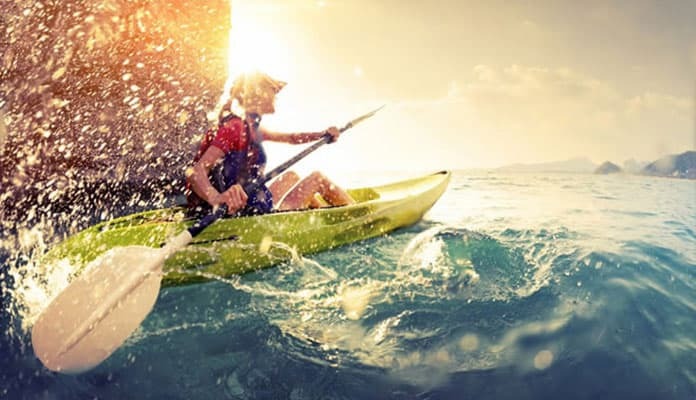 Kayaking has dominated the watersport industry for many years as one of the biggest go-to sports for water enthusiasts. In this time, paddlers have been expanding what they are using their kayaks for. This has forced manufacturers to gear their designs for fishing. Kayaks are built to be durable. Even inflatable boats are often made using military grade materials that are often more durable than hard boards. This means that you do not have to worry about springing a hole in the middle of the lake. Q: Where Do You Keep Your Catch? A: Fisherman will vary on where they choose to keep their catch. Quite simply this means that you have options and can decide what works best for you and the design of your boat. You may want to bring along an ice box or cooler to store your fish in so they stay cool and fresh. This is especially ideal when spending long hot days on the water as you don’t want to worry about your catch going bad. Alternatively, you may want to bring a black bag and line one of your internal storage cubbies in your boat. This is the most common option that most fishermen choose. Typically speaking, fisherman will choose to hold their personal gear and tackle in their back storage unit and reserve the front one for storage of their catch. Then, you can simply throw your catch in their and seal it up. This can be a great option for those on choppier waters and makes for a very easy clean up. Lastly, many fishermen bring a simple bucket with them. They then throw their catch inside and seal it up. This works well as you can fill with ice or water to keep it fresh. Having it on your deck will provide easy access to it while keeping it out of your way. Q: What If I Fall In The Water While Fishing? A: It is unlikely that you will fall into the water when fishing as kayaks are designed to be stable. They also allow you to sit low in the water making it more difficult for you to tip. With that being said, the jerking motion of you casting your line or an unexpected wave can make it so that you tumble into the water. If this happens, the best thing you can do is be prepared. Before you set out into the water on your first fishing trip, it is important that you practice how to deal with a flipped kayak. While you may not want to roll your kayak and intentionally get wet, knowing that you can easily get back into your kayak is extremely important. Building this confidence will help reduce the panic you feel in the event that your boat does capsize. If your boat rolls, you should have a PFD on which means that you will be safe. As stressful as it is, do everything you can to stay calm. If you are wearing your life vest then the first thing you should do is get yourself back into your boat. Do not worry about your gear floating away until you are safely back inside. If you are not wearing a life vest but have one with you, start by putting your vest on first thing. Do this even if you are a strong swimmer. This is important because you do not want to risk getting tired after a few failed attempts to get into your boat. You may be wondering how to get back into your boat after capsizing. First, swim to your boat and place yourself in the stern half. Flip your boat upright. Then cross your hand to the other side of your kayak and lift yourself out of the water as if you were getting out of a swimming pool that doesn’t have a ladder. Lay with your chest down on top of your kayak in order to spread your weight evenly. When you feel stable carefully swing your legs around to go inside of your cockpit, still facing down. Once your legs are inside, cross them back to the right way around and put your hands on either side of your boat making it stable. Carefully flip your body sliding yourself down from the back and into your seated position. Once you are carefully seated in your boat, you can then begin to rescue your gear. This should start with your paddle. Use your hands to act as a paddle and push you towards your paddle. Once you rescue your paddle, then you can worry about getting the rest of your gear. When you have recovered all of your stuff and are safely back in your boat, you should immediately paddle to the nearest shore. Once there, take a minute to recoup and get your bearings. You can use this time to drain any excess water that may be in your boat. Most importantly, grab your dry clothes that should be in a dry bag and change. You do not want to sit in wet and heavy clothes, especially on a cooler day. Being wet is the number one cause of getting hypothermia. It does not have to be a freezing day for this to be a concern. Be sure to stay safe, warm and dry. A: As with any watercraft, taking care of your kayak does require some work. While not overly complex, you will want to do some work in order to keep your kayak in top shape. The best thing to do is to rinse your kayak. This is especially important if you are traveling between different bodies of water. Lakes contain sensitive microbes that are unique to that specific body of water. It is important to not introduce these to other bodies of water. Additionally, the ocean is full of salt which can cause harm to your boat. This poses even more of a threat to any metals that your boat may feature. The best thing to do for this is to simply rinse your boat. Using a hose, spray off your kayak after every use and before storing your boat. Be sure to open up your compartments and rinse inside as well. Allow your kayak to thoroughly dry before storing. When not on the water, it is best to limit the amount of time that your kayak is exposed to direct sunlight. This harsh light is hard on a lot more than just your skin but also on your kayak. It can cause the color of your kayak to fade and jeopardize the quality of your boat. When storing your boat, we recommend using a wall mounting kit to help ensure that your kayak is stored safely and off of the ground. This will help to reduce the chances of your kayak being bumped or scratched when not in the water. When storing your boat for extended periods of time, be sure to give your whole boat a once over to spot and scratches, holes or potential issues that may develop while there. Similarly, when transporting your kayak, you will want to do so safely. The best way to do this is with a roof rack mounting system. This will provide a safe method for you to get your fishing kayak to and from the water. If you find yourself looking to transport more than two boats, you will need to get a kayak fishing trailer to accommodate the added load. 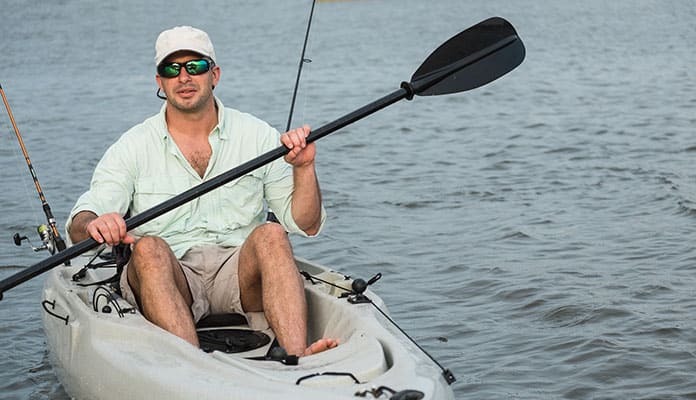 Q: How Do I Know If The Kayak I’m Using Is For Fishing? A: The kayaks you use for fishing may look quite similar to standard kayaks, especially on first glance. It is not until taking a deeper look that you will notice the key differences between a standard kayak and one intended for fishing use. Fishing kayaks come with added features not found in other kayaks. Almost all fishing kayaks will have rod holders. This will allow you to bring along your rods and fish hands free. Other times fishing kayaks will also have paddle clips. This is a clip that is on the side of your kayak that allows you to put your paddle in and secure it out of the way. This frees your hands and allows you to cast your fishing line without concern of losing your paddle. Oftentimes, fishing kayaks will also feature extra storage and a heavier weight capacity. This works to accommodate the extra gear you bring along with you and also give you somewhere to put your catch. A lot of the time, a kayaks measure of stability will be the greatest factor in determining how ideal it is to be used for fishing. 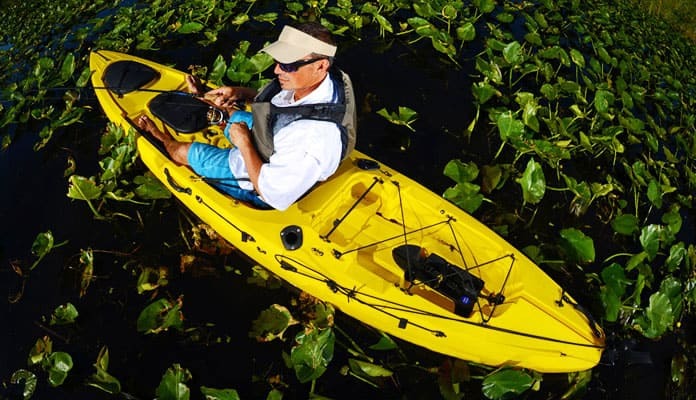 While you can add accessories to make virtually any kayak ideal for fishing, some come naturally equipped for this activity. Most manufacturers will mention “fishing” in the name of their boats in order to attract consumers to these products. If you are still unsure about whether the kayak you are looking for is suitable for fishing, feel free to read the kayak fishing reviews in order to see what other consumers are saying about the boat. Using your kayak for fishing is a popular idea in the fishing world. These small fishing kayaks will take you to places that are hard to otherwise get to allowing you to get to the best fish. 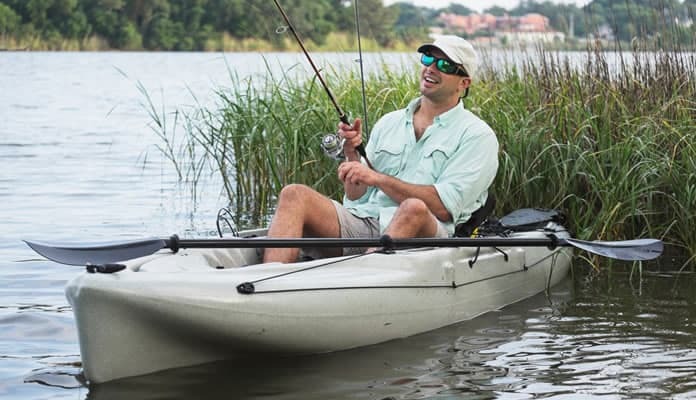 With slender designs and added attachments, these fishing kayaks are built for comfort allowing you to spend long days on the lake. Fishing kayak reviews agree that a comfortable spacious cockpit is one of the most important features to look for. Having on board rod holders and paddle holders will free your hands and allow you to clear your mind. New to kayaking or have a fishing kayak on our list? Let us know how you like it in the comment section below.